Bowhunters Get the UNO App Today! The Velocitip Ballistic System is archery’s most hi-tech tool. Rugged and easy to use, any archer can benefit by using the system to improve performance from the ground up. Designed by archers – for archers. See how the Velocitip Ballistic System can help you. The Velocitip System delivers precise Archery Sight Setups on your Smartphone! Hundreds of today’s top bows have been tested with the Velocitip System. This data is used by the estimator included in the UNO Archery App to make sighting in almost any bow sight a piece-of-cake. To use the app, archers simply sight-in at one distance and provide the app with: arrow speed; vane type; and peep measurements. The UNO Archery App immediately displays the custom sight marks for your setup. These precise sight marks displayed on the phone screen are easily transferred to any multi-pin sight. Customize the pin selection for any setup. Then position your sight pins to match the pin positions displayed on the phone. 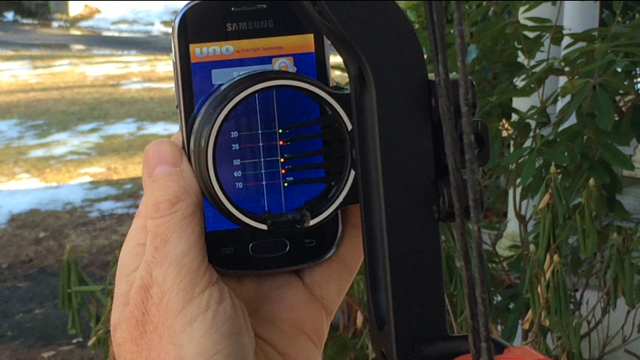 The UNO archery app can also be used with any linear single pin sight to create customized sight tapes anywhere. The app can be used with yards or meters. GET THE MOST OUT OF YOUR SHOT TO IMPROVE YOUR PERFORMANCE. The Velocitip Ballistic System allows you to easily identify differences in downrange ballistic performance using measured values. Quickly perform your own testing to find out how you are performing and where you can improve. Find out how to deliver maximum kinetic energy with your existing equipment through changes in arrow/vane selection and tuning. Test your bow against the latest models to see what’s best for you. With data that is much more comprehensive than available from chronographs, you can be assured you know exactly what your arrows are doing at any distance. Never before have you been presented with such a wealth of information to dial in your shot. Remove the guess work and try a Velocitip Ballistic System today. The Velocitip Ballistic System allows you to easily identify differences in downrange ballistic performance using measured values. Quickly perform your own testing to find out how you are performing and where you can improve. Reduce or eliminate those elements of equipment and form that increase arrow shaft oscillation and speed-robbing arrow drag. You’ll increase the interest and participation of young archers when you introduce them to the coolest electronic system available. Simply attach the Velocitip electronic field point as a direct replacement for a conventional field point. Take up to 4 shots. Measures ballistic performance for each shot. Remove and plug into the handheld LCD docking station for download and immediate display of arrow flight ballistics. Use again and again. Have questions? Want to purchase a Velocitip Ballistic System? Click here to Fill out a quick form to Contact Us. "The Velocitip from Full Flight Technology gives archers an in depth look at the flight characteristics of their arrows. From shot to impact, the Velocitip gives archers the information they have long needed to make effective and informed adjustments to their arrow flight. An invaluable last step in the bow tuning process." © 2011 Full Flight Technology, LLC. Full Flight Technology and Velocitip are registered trademarks of Full Flight Technology.